Alexander Murphy, holder of the UO's James F. and Shirley K. Rippey Chair in Liberal Arts and Science, will receive the 2014 Lifetime Achievement Award from the Association of American Geographers (AAG). Murphy, a professor of geography who has been at the University of Oregon since 1987, will be formally recognized during an April 12 awards luncheon, during the association's annual meeting in Tampa, Fla. 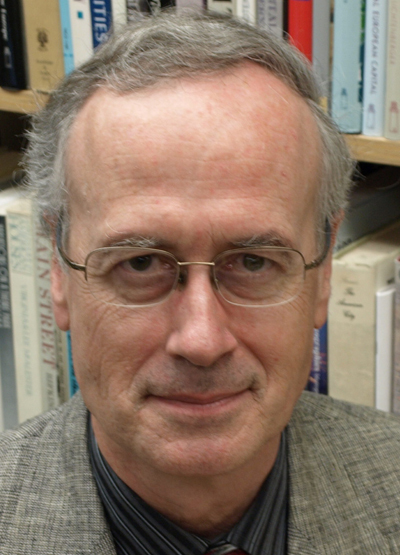 He was selected, according to the AAG announcement, "to recognize his extraordinary contributions to understanding the world's changing political-territorial order and the impacts of the political organization of space on geopolitical relations and ethno-national identities, his outstanding teaching and mentoring record, and his exemplary leadership and 'disciplinary citizenship' in support of geography." A lengthy citation noted Murphy's service as president of the AAG and his membership on numerous association committees, as well as his leadership educational roles in the National Geographic Society, the Association of Pacific Coast Geographers and Academia Europaea. Murphy's leadership in an effort to add geography to the College Board's Advanced Placement Program and his chairmanship of the National Academy of Sciences' National Research Council Committee that identified Strategic Directions for the Geographical Sciences" also was noted. "As a political geographer, Dr. Murphy has made a lasting impact that makes him a deserving recipient of this award, which is the highest honor handed out by the AAG," said Kimberly Andrews Espy, vice president for research and innovation and dean of the UO Graduate School. "We congratulate him on this outstanding achievement." Murphy holds a bachelor's degree (1977) from Yale University, a law degree (1981) from Columbia University and a doctorate (1987) from the University of Chicago.